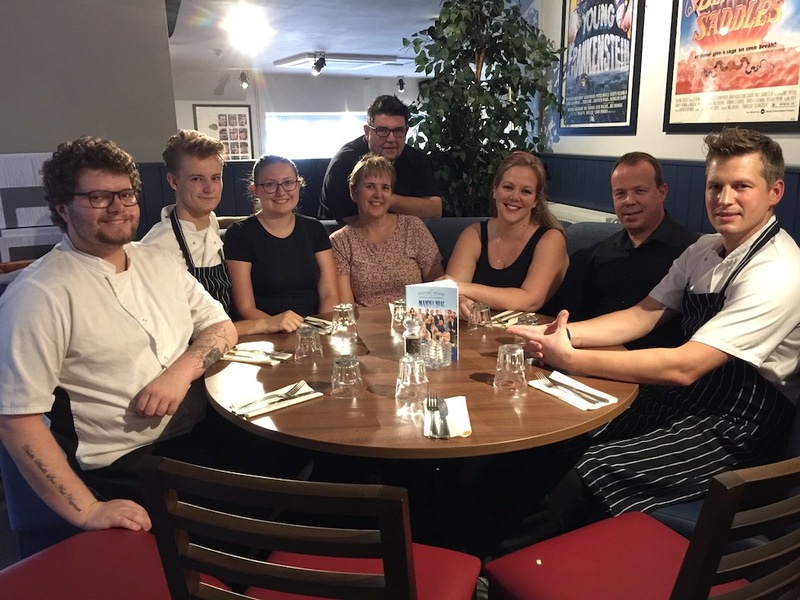 Kevin Markwick with some of his team in The Picture House Restaurant which was refurbished earlier this year. Kevin Marwick was once, twice, three times a winner at this year’s Uckfield Business Awards. 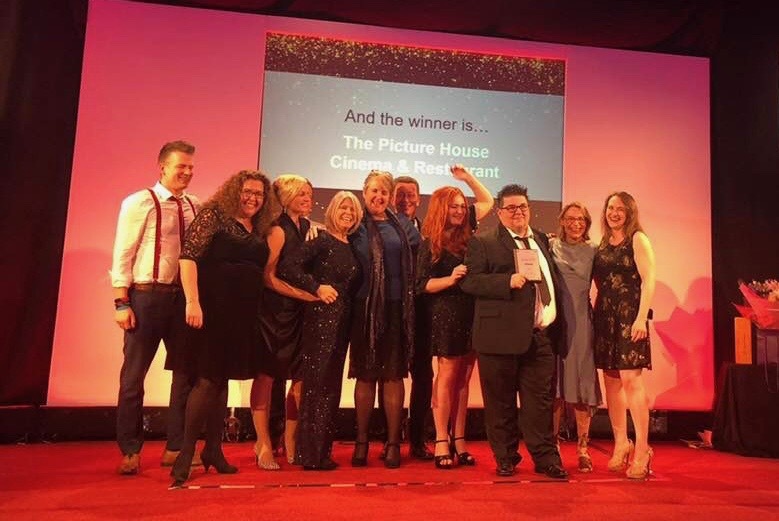 The Picture House Cinema and Restaurant were nominated in two categories of the awards, run by Uckfield Chamber of Commerce, and were surprised to end up winning three. The Picture House won both categories it was nominated for, Business of the Year and cinema owner Kevin Markwick for Business Person of the Year (Male). The surprise came when cinema owner Kevin Markwick also received the Outstanding Achievement Award, awarded to an individual who has demonstrated outstanding achievements in their business life. 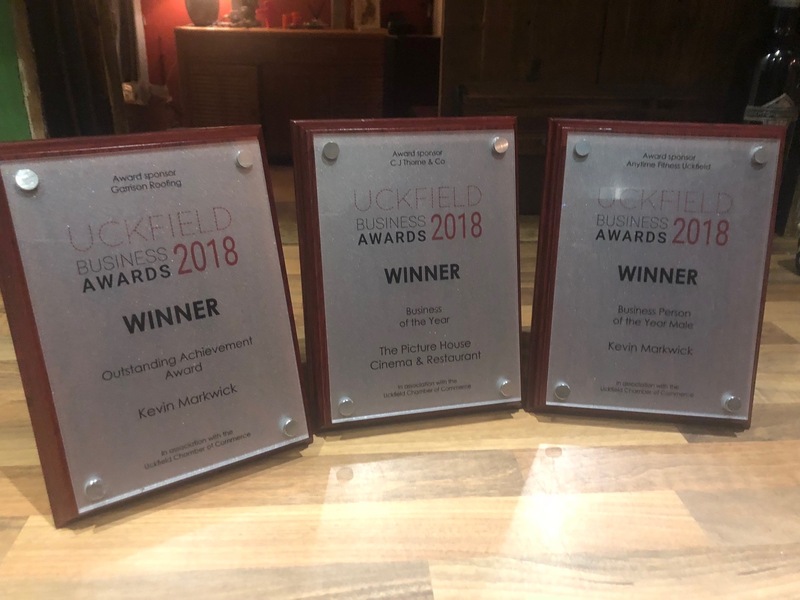 The three awards won by The Picture House Cinema and Restaurant in Uckfield: Outstanding Achievement, Business of the Year, and Business Person of the Year. Kevin Markwick with some of his team from The Picture House on stage at Uckfield Business Awards. 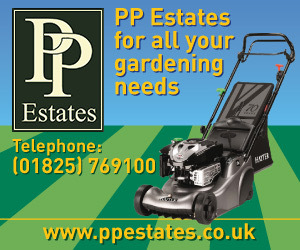 These awards follow substantial recent investment into the business including a complete refurbishment in 2015/16 and this year the purchase of Sony 4K projectors, refurbishment of the restaurant plus the launch of a new website. The Picture House Cinema and Restaurant have also been nominated for Cinema of the Year (under 24 screens) at the Screen Awards. And Kevin has been nominated for Business Person of the Year at the Sussex Business Awards. Both these awards ceremonies take place later this month. There was also success at the town’s business awards, held last week at the East Sussex National for other members of the Uckfield Directory, part of the Uckfield News Network.